Sebastian Vettel of Ferrari during testing. Snow blew out the third day of Formula One's pre-season testing on Wednesday, with only five drivers eventually venturing out on the slippery track and McLaren's Fernando Alonso alone in completing a timed lap. 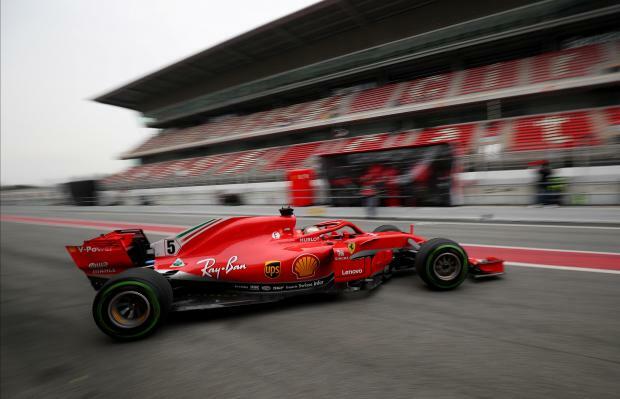 The Spaniard's 'fastest' time of two minutes 18.545 seconds, set right at the end, was nearly a minute slower than Sebastian Vettel's Tuesday best for Ferrari. "Today, it felt more like being in Finland than Spain," said Ferrari's Kimi Raikkonen. "And everyone knows there’s no Formula One in my country." Apart from Alonso, who ended up with 11 laps, the only drivers to appear were Red Bull's Daniel Ricciardo, Toro Rosso's Brendon Hartley, Sauber's Marcus Ericsson and Robert Kubica for Williams. With the grandstands empty for most of a day that started with the paddock and circuit under a white blanket, the pit lane was declared open at 1200 local time - a delay of three hours -- as snow gave way to rain. "You don't learn anything. We will never race in this circumstance, and the only thing you do is risk the car," commented Haas team principal Guenther Steiner. "This being the first test of the season, we are lean on spares, and we cannot risk it. And at the moment it does not look much better on Thursday. It is getting warmer but still wet." Teams had discussed adding a day on to the second test but that would only have been possible by all agreeing to scrap Wednesday's session. McLaren racing director Eric Boullier said two teams had objected, a move he said was "purely wasting money for selfish interests". The lack of testing was a blow to Mexican Sergio Perez, who had been due in the Force India on Wednesday and has yet to drive his team's new car. Four-times world champion Lewis Hamilton, who completed 25 laps for Mercedes in cold and damp conditions on Monday, was another lacking mileage - which at least allowed Valtteri Bottas to feel ahead of his team mate.